"If the dead can't rest in peace, how on Earth can the living?" There are many assumed haunted forts located around the world. Like several other historical locations, numerous forts have their own share of ghost related stories. The forts that still stand in today’s world served many unique purposes throughout history. Most were used as military posts during times of war. Many were created as fortresses to protect cities. Many forts were established to operate as an enterprise that was privately owned in order to protect various types of pioneers throughout history. These structures stand as a reflection of our past for our present day. It appears that more than history has touched the walls of these forts. Many spirits are believed to haunt the inside and outside of these structures. If you were to review the history surrounding the forts throughout the world, you would find that each has experienced its own fair share of hardships. Many individuals have suffered physically and emotionally within and outside the walls of the buildings. Many different types of diseases and other medical conditions have made their way in and around the forts. In addition to this, several individuals – women, men, and children alike – have met an untimely and often tragic death within the walls of the forts throughout the world. There are many documented cases of death occurring outside the walls of the forts of the world as well. It is no wonder that so many individuals believe that there are quite a few haunted forts around the globe. If you consider the history associated with forts located around the world, and then combine that with the violence that has taken place in and around the structures as well as the sheer amount of tragedy, you have all the ingredients for the perfect haunted location. There are many popular stories of haunted forts. Throughout this section of Haunted Places to Go, you will be introduced to several of these spiritually charged locations. You will learn about the unexplained phenomenon, the strange smells, the sad cries, and the mournful spirits that linger in and around of some of the most historically rich locations throughout the world. If you enjoy learning about historical figures and events, or you are interested in the paranormal tales of our culture, you will thoroughly enjoy learning about the haunted forts that are part of our world. From the earliest days, there have been stories of paranormal events, spiritual encounters, and basic hauntings at Fort Mifflin. 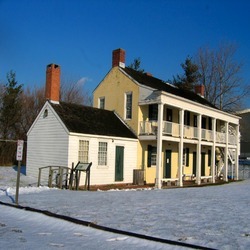 Since the fort has been opened to the public, there have been numerous reports made by the employees as well as visitors of what appears to be paranormal activity.